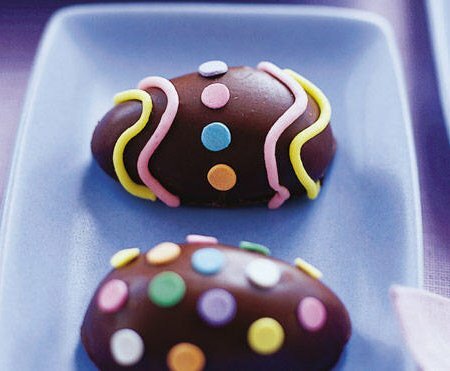 The basic recipe calls for using baking chocolate and some egg-shaped moulds to make your chocolate eggs - a great way to use up some wholesale chocolate, by the way! Then how you decorate them is all your choice. There are tonnes of edible Easter decorations available in markets today - you can just buy whatever suits your theme and stick them onto your finished eggs. From flowers and birds to simple candy dots and sticklers, you will definitely find something to suit your budget, and your child's fancy. So let your child's imagination run wild, and help them create their edible Easter masterpieces! 1. Melt the Chocolate first by placing it into a small bowl which you place inside a larger bowl which has some hot water in it (double-boiler method) Be careful not to get any water into chocolate as this will make the chocolate go wrong and not set properly. 2. While the chocolate is melting clean out the Chocolate Egg mould using a small amount of cotton wool. 3. When the chocolate is melted and has no lumps, pick up the large brush and start painting the inside of the Chocolate Egg moulds. Once you have coated the whole of the inside of the mould with chocolate, place it into the fridge for five minutes. Repeat as many times as you like, forming a thick layer inside the mould. Leave it in the fridge for at least 10 minutes to set firmly. 4. Once set, you can remove the egg from the mould. Place the mould upside-down onto the table and give a gentle tap on the top. Then gently lift the mould and the egg will stay back on the table. Mix up some royal icing in a pot, add tints of colors to make leaves or flowers, and then fill this into separate icing bags. Use proper icing attachment and pipe your desired shapes onto the chocolate eggs. You can also stick some ready-made edible Easter decorations by sticking them onto the eggs using royal icing as glue. Very cool indeed. At some point I should really try to make something this delicate...I wonder...could I? very nice recipe. Love the pic it looks absolute divine. Wonderful easter egg looks so perfect and cute!! These are beautiful and you're right! So much tastier than a cold, boiled egg! Beautiful!! Those eggs are so beautiful!I would love to make something like that! Can't believe easter is around the corner. Lovely easter eggs! They look so nice....feel like tasting them! Oh My!!! they look delectable! thanks for the recipe my family will love these! I wish I saw this post earlier! I was actually looking for an activity for my niece and nephew since they were going to spend Easter here. They live a couple of hours away so, I don't get to see them that often. It's a great idea, and I think it's a fresh new twist from using the normal hard-boiled egg, or even the plastic ones. It would have been a plus for me too, since I love chocolates and I would have eaten every single one of them even if it decorating them took lots of time. Haha! Oh my... I'll say exactly as Barb said - so adorable, too pretty to eat... but I would! yummy! both chocolate eggs are so adorable and of course it's too pretty to eat. love the pic it looks absolute divine.they looks so nice..... feel like tasting them. yummy ! both chocolates eggs look so fantastic.i should really try to make something this delicate so i wonder...could i. lets try i can't wait anymore . i really love this recipe. I have never even considered making easter eggs at home. Sounds like a great idea. I might try it next year. These are beautiful! Great job!! !